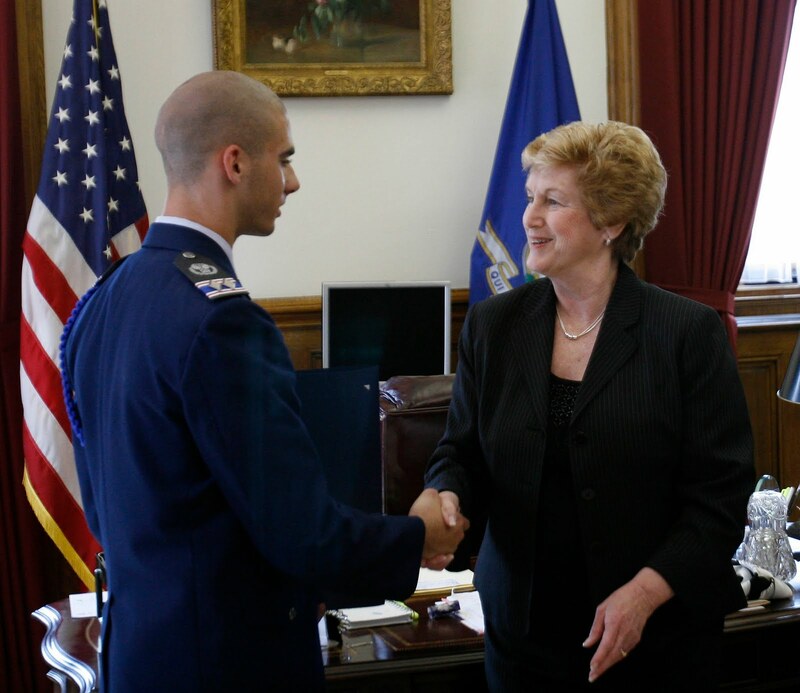 Connecticut Governor Jodi Rell recently presented the General Ira C. Eaker Award to Cadet Ryan Chapman, a junior and commander of the Civil Air Patrol (CAP) cadet program at New Fairfield High School. The General Ira C. Eaker Award, which denotes successful completion of all achievements of the Civil Air Patrol Cadet Program, is one of the highest honors in the cadet program. The award was named in honor of the late Air Force General Ira C. Eaker, aviation pioneer, career military officer, and one of the chief architects and visionaries of the US Air Force. In conjunction with the award, Cadet Chapman was also promoted to the rank of Cadet Lieutenant Colonel, making him one of the highest ranking CAP cadets in the State of Connecticut. Cadet Chapman joined CAP as a cadet when he was 13 years old and has been active in the program for the past 4 years. During this time, Chapman has earned numerous emergency services qualifications and has graduated from three Search and Rescue courses, including the team leader course. Chapman trained with the Air Force’s elite Pararescuemen (PJs), Special Operations operatives trained to recover downed pilots in combat. Ryan has also earned his wings by graduating from the CAP Glider Academy where he learned to fly gliders. Cadet Chapman was elected as the primary Connecticut representative for the Northeast Region Cadet Advisory Council, a council of CAP cadets representing each state in the Northeast with the mandate of improving the cadet program. Over the past year, Cadet Chapman was the Cadet Commander of not one squadron cadet program, but two cadet programs simultaneously. As the Cadet Commander of the 399th Composite Squadron (CT-042) at the Danbury Municipal Airport, Chapman’s leadership contributed to a doubling of active cadets in the squadron and the unit earning the Squadron of Merit for the best cadet program in Connecticut Wing for 2009. Cadet Chapman also led the 399th ground team that was credited with finding a distress signal emanating from a fishing vessel on Long Island Sound. As the Cadet Commander of the 801st Cadet Squadron (CT-801) at New Fairfield High School, Cadet Chapman helped recruit the first cadre of cadets and establish the first school-based cadet program in the State of Connecticut. Although initially established as a flight in 2009, CT-801 has grown to 26 members and was chartered as a cadet squadron in January 2010 signifying the increased membership of the program. Cadet Chapman has been the key to getting this new school-based cadet program started and moving forward as all other members of CT-801, both cadets and teachers, were new CAP members in 2009 when the cadet program was formed.